I keep seeing all of these classroom set ups that are beautiful and organized and ready for students. In the meantime, my classroom looks like the photo above. Thanks to a great volunteer and my director, my room just received a fresh coat of paint, which required my room to get to this state until the paint has a bit of time to set. Despite this, I ventured into my room today to try out my fall calendar cards to see which ones I might like to use this autumn. Before I printed them out I looked at my themes for the year to get an idea of which calendar cards I might want for each month of the entire year. After doing that I penciled in a couple new ideas for calendar cards for the spring that I hope to add to my calendar bundle later. I realized as I was taking these photos that I did not print the page with the days of the week to go along with my fall calendar numbers and month. That will be next on my list. I chose to make my calendar cards a bit smaller than the pocket because I have found that those too close to the same size as the pocket are really difficult for preschoolers to put in the calendar. My cards try to take into account that you may have a laminated edge around the cards. Even with this laminated edge there is room to easily slide the cards in and out of your calendar. 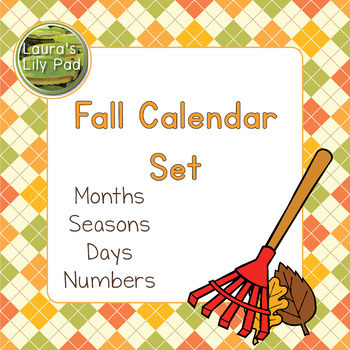 Interested in some calendar sets for your classroom? Just click the image below to check out the fall set. I added two more sets of months cards after I decided I just had to have a couple more choices for myself.